University of Iowa graduate and UI Stanley Museum of Art staff member Lindley Warren and UI MFA student Jacob Jones join Stanley Curator Joyce Tsai in showing Lena Stringari, deputy director and chief conservator of the Solomon R. Guggenheim Foundation, around the museum’s Visual Classroom in the Iowa Memorial Union. UI students who work in the Stanley and with its curators have the opportunity to make valuable connections with the professional art world. Photo by Tim Schoon. Dalina Perdomo-Álvarez was working toward her MA in film studies from the University of Iowa but she wasn’t exactly sure what she wanted to do with her degree. While exploring possibilities, she took a museum studies course through the School of Art and Art History. That class launched Perdomo-Álvarez on a new trajectory that included working as a gallery attendant at the UI Stanley Museum of Art and becoming a research assistant for a project related to the history of intermedia led by Joyce Tsai, clinical associate professor in the College of Education and a curator at the museum. 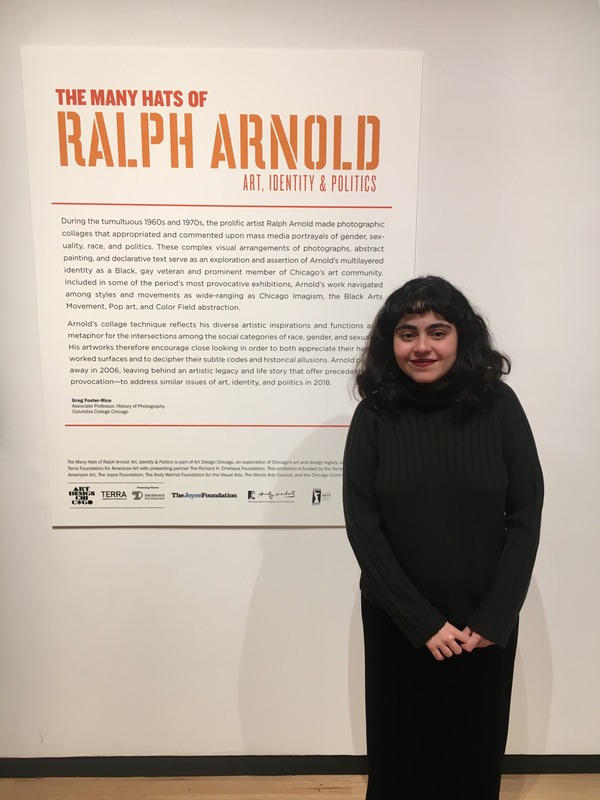 Perdomo-Álvarez says these experiences are the reason she landed her current positions as a curatorial fellow for diversity in the arts at the Museum of Contemporary Photography in Chicago and as a distribution assistant at Video Data Bank at the School of the Art Institute of Chicago. The opportunities Perdomo-Álvarez found through the Stanley Museum of Art are not unusual at the UI. This past year, 15 students from various disciplines across campus worked with museum staff to research items in the collection, learn about the scientific methods to analyze artworks and the materials that comprise them, assist in assessing the condition of the art, give tours of the museum, and contribute to outreach. Lauren Lessing, director of the Stanley Museum of Art, says students learn a range of skills when they engage with the museum, whether through the curriculum or professional work. Gallery attendants, which Tsai calls the public face of the museum, may be the most visible students working there. Among other duties, gallery attendants answer questions from visitors, lead tours, and work with security as the first line of defense in making sure the artwork is safe. UI alumna Dalina Perdomo-Álvarez says her experiences at Iowa are the reason she landed her current positions as a curatorial fellow for diversity in the arts at the Museum of Contemporary Photography in Chicago and as a distribution assistant at Video Data Bank at the School of the Art Institute of Chicago. Photo courtesy of Dalina Perdomo-Álvarez. Perdomo-Álvarez became more familiar with the collection as a gallery attendant, and she learned more about the different jobs in the museum—how it works to take out a loan or purchase a work, or what a registrar does. Behind the scenes are the interns and research assistants who work with the curators, as well as students in museum studies classes. Tsai, who secured a pedagogy grant from the Mellon Foundation–funded Digital Bridges for Humanistic Inquiry for a project related to the history of intermedia at the UI, created a course that empowers students to conduct original research to reconstruct lost, partially extant, or otherwise imperiled intermedia works. This research, along with additional work by research and graduate assistants, is being used to create a research portal to make previously unsearchable resources available worldwide. Jacob Jones has a graduate assistantship with the Intermedia Research Initiative within the museum and is focused on video archiving standards and writing metadata for items in the collection. The first-year MFA student in intermedia from Oklahoma City, Oklahoma, says it’s fascinating to work with the diverse collection, which includes works by former faculty and graduate students as well as artists such as Nam June Paik, who is considered to be the founder of video art. Staff are continually looking for new ways to involve even more students in the museum’s work. Museum staff welcome students from across campus to help advance the museum’s mission. For example, Tsai says chemists are examining a type of metal soap formation that emerges in paints over time. She is working with experts at the Midwest Art Conservation Center and other leading institutions to better understand this very new phenomena. Lessing says while students and faculty from outside the arts conducting research on the collection is beneficial for the museum, it’s also beneficial in classrooms across campus. Perdomo-Álvarez she eventually hopes to find a position as a curator of film, which would in many ways combine her two current roles.